Fairies never fail to amaze children. They captivate them with their pretty faces, slender bodies, tiny wings and of course, their magic wand. Pixies are associated with wishes. They are very child-friendly characters that most of us grew up with. Remember, Tinkerbell in Peter Pan, three cute fairies in Sleeping Beauty, Fairy Godmother of Cinderella? Who else can you remember? The gifts of faith and trust are important in our life. Among the first things that children learn is trusting. They trust the hands that hold them, that carry them. They develop belief to the people around them. These feelings make them feel guarded and loved. “Faith, Trust & Pixie Dust” decal is an enchanting wall design that would remind us the wishes of fairies in the fairytales. Well, of course, minus the witch fairy. Place this above the headboard of your princess’ crib to look as if she is guarded by a fairy godmother. This decal will complete the look of your baby girl’s princess – like room. Truly, here, she’s been gifted with real beauty. Click more images to see how this wall design will look like in a room. 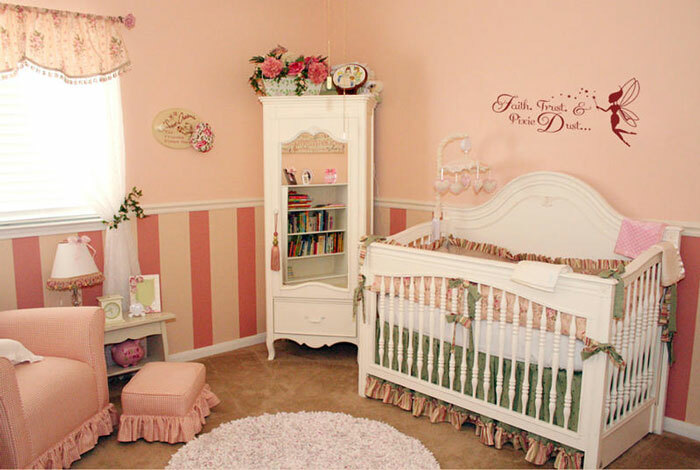 The wall lettering complements the blush – colored baby girl’s room in a classic style with contemporary twists. 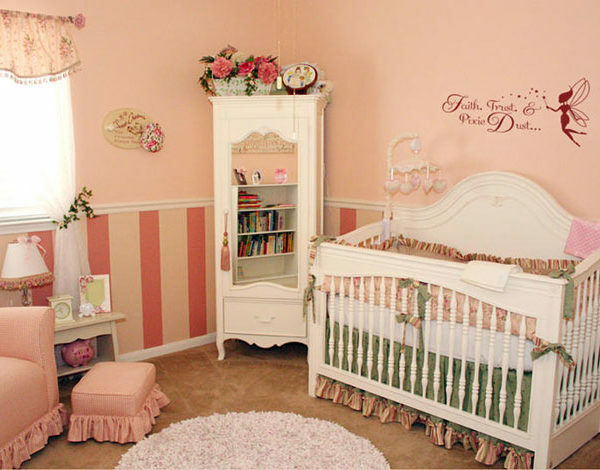 To complete the details of this room, the wall décor: Faith, Trust & Pixie Dust” was added as the finishing touch. It comes with a silhouette of a fairy flicking her magic wand to complete your baby’s fantasy world. Check out more wall design options for your baby’s room in our kid’s bedroom gallery. We have plenty of playful designs to choose from.